When I visited Japan, this one was one of my top most wanted list, in which almost in the same time its available in Essen Spiel 2016. Kinda a hit during the last TGM (Tokyo Game Market) in 2016. The game comes using VR (virtual reality) technology, yes VR. The theme is that you guys are treasure hunters or maybe a team of archaeologists that visit pyramids to search something precious or historical. But getting into pyramids is not easy and the only thing you can get inside is through a hole that is not big enough for a person, but luckily among you is a trained cute dog that can help you to find the thing. But you need to navigate it through holes around the pyramid. 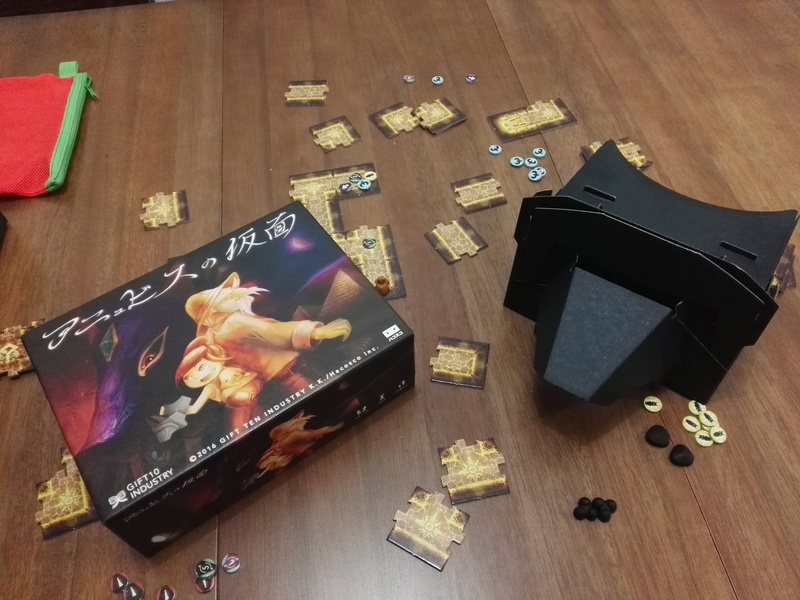 The game can be played by 3-7 players by using a smartphone that compatible to VR. You need to download a dedicated app first though the VR goggle is provided from the game (you need to assemble it for the first time). In the game, players will choose which map they want to play and then take turns to be the viewer using VR goggle and describe to other players what they see inside the pyramid (each player is given 60 seconds to examine and describe surrounding place, I believe you can adjust the length of viewing time in the setting). While the viewer is on VR goggle, the rest of players try to mapping the pyramid by using map tiles and other items (tokens) based on what the viewer describes. After the time ends, the players stop their activities and discussion is allowed after the viewer examine his team mates mapping result. The next viewer takes the VR and repeat the same process with new vision. He/she will start in a different spot, which gives players different perspective of the map. After all players complete the viewing time, they will have to combine all the perspectives together to make a single complete map of the pyramid and check if their team-made map is the same with the real map. If its a match, they are success and managed to unlock extra stage of that map. The app provides many stages with different levels of difficulties and also different viewing times. Its quite interesting aside from the normal mode, there’s also a time trial and an extra stage in each map. So its a long road to complete all of them and the developer can also publish updates with more map contents easily through the app, except the tokens and tiles. The game is really fun, suitable for children, family and friends altogether. The first experience may be hard and several tries are needed to get used to (aside for viewing the map) communicate with your team. 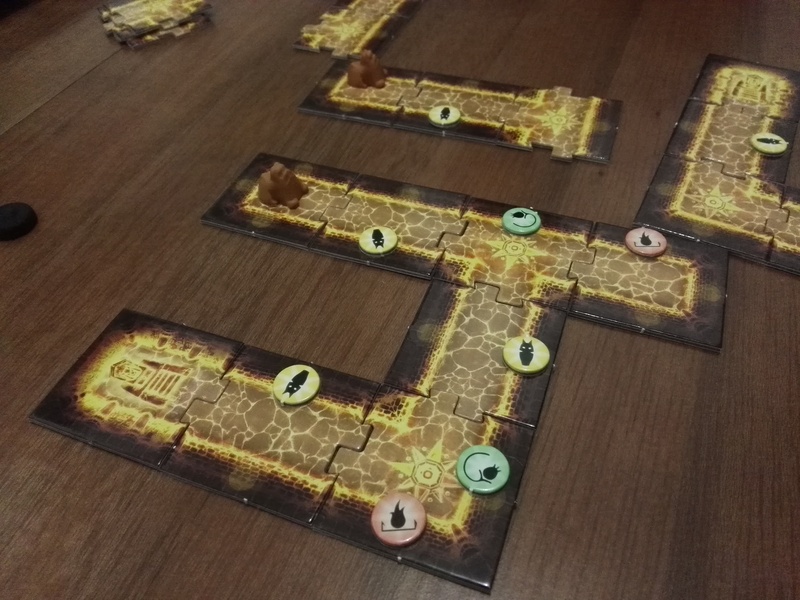 With more experience and plays of the same group, this game rewards more quality play over time since players will get to know more of each other and how to communicate with each players. So enough with the good words, how about the bad? 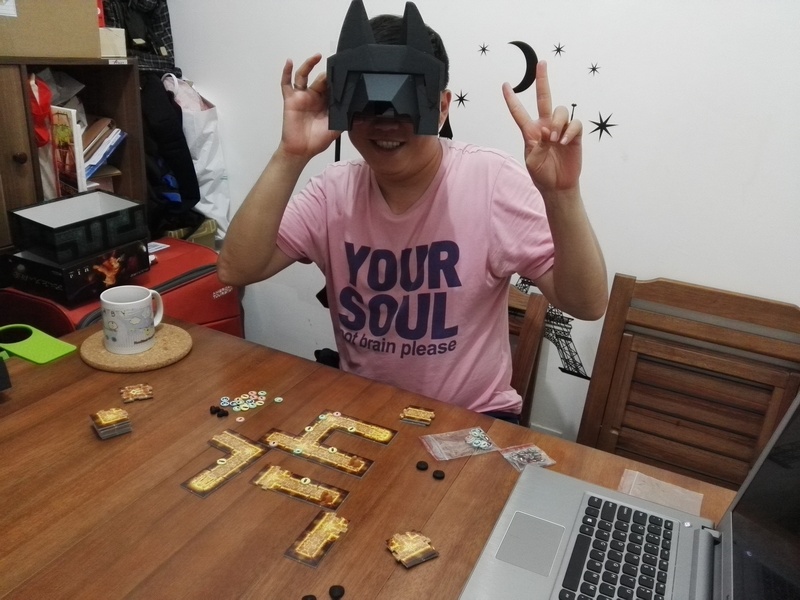 Well for one the mask / VR goggle is quite hard to assembly and also has a quite thin card board quality. After several plays I am a bit concern that the mask is quite fragile. I even bought a new VR cardboard but even that is not a good quality. 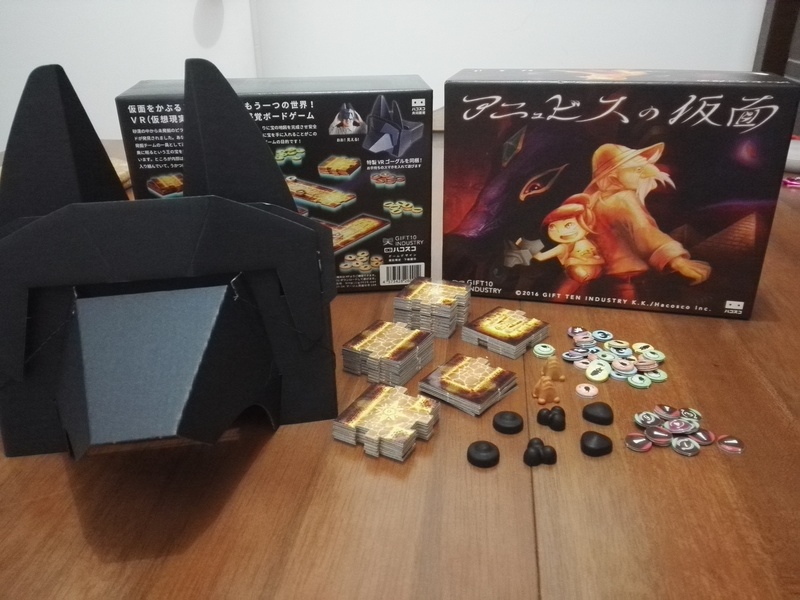 My other issue with the game is that even they thought about how to store the game (I mean the Mask) its kinda tiresome and reluctance to strip down the mask (even not strip the whole thing) and store it inside the box.